Indira on the other hand believes that the portrayal is changing because women’s voices have grown stronger in the recent times. She also explains how the struggles that a woman used to go through to enter the world of literature as a writer has become less dramatic now. Male writers dominated the literary scene during the 20th and the 21st century. The reason for such dominance was probably because the critics were mostly male. Now with a lot of female reviewers and critics, the scene is changing. There was an accusation against women writers that they wrote mostly about domestic issues while men wrote about the societal issues. Indira says the conditions that prevail amongst the lives around the women writers compel them to write about the domestic issues. Ambai does not agree that women do not write about the world outside. She quotes example of a woman writer who wrote about her experiences of studying medicine and another where a writer talks about a younger cousin who is in love with a married elder cousin. Women have started exploring various relationships – their relationship with men, their relationship with their body etc, say the authors. When asked about her story where a woman speaks to a spider, Ambai says that in ancient literature women always spoke to inhuman things. She adds that she too talks to the utensils in her house especially a Dosa tava which is troublesome if not spoken to. Anjana explains how in recent times women superheroes have been created out of mythology. She quotes the example of Shakti who hunts demons. Indira welcomes the idea of a mythological superhero but also impresses upon the fact that every woman is a super hero of her own sorts. 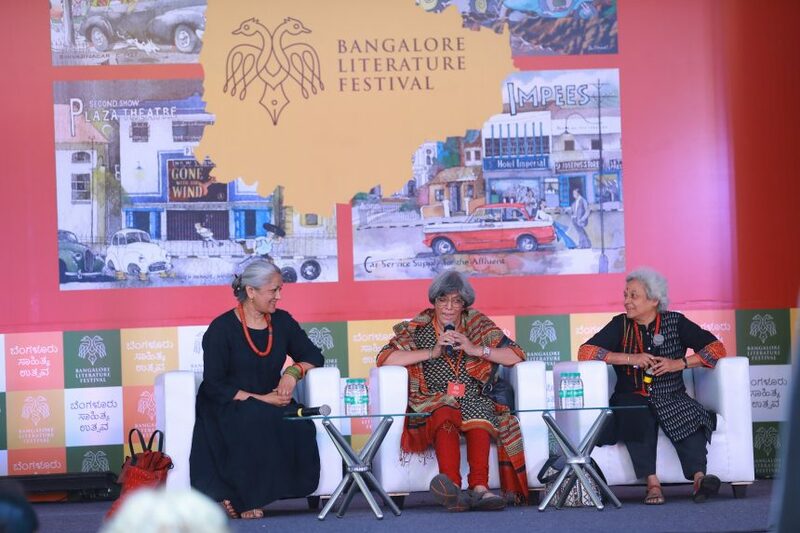 Indira also expresses her pleasure that the upcoming literature on women from mythology is an indication of how women have taken ownership of the narrative. She might not agree with some of the interpretations, nevertheless they are welcome changes. Anjana questions how in the earlier days, queens were always the heroines of the stories. Ambai again says it is not true. Stories have been written about the common woman too. Unfortunately, those writers are not read by new age readers. Ambai touches upon how a specific kind of language was used to talk about men and women in literature in the earlier days. She explains how a man is compared to a mountain and a woman to a creeper and her mouth to some fruit. If it is a man’s heart, it would rise and fall like the waves of the sea, but if it were a woman’s it would be like a boiling pot of water. Such choice of language is changing in the recent times according to Ambai. When Indira talks about her story of a financially independent widow, she says she was worried if she was right to assume that a widow would be financially independent. She says she went on about researching to find if there ever existed such women in history and did find one in the 19th century. Ambai explains how her grandmother was a financially independent widow. Ambai also talks about how her mother was instrumental in getting her admitted to a college in Chennai and how she told her that all her dreams would come true. Such heroines have always been around us and we take them for granted, concludes Ambai.